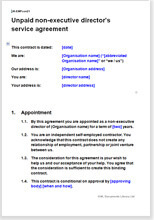 This non-executive director's service agreement is a contract for services for an unpaid, part-time director. It makes clear no contract of employment. It can be used for a fixed term or a running contract for a company director, or director-level equivalent in a charity or other organisation. It provides particularly strong protection of company information. This is a service agreement that sets out the contract for services between a non-executive director and a company or other organisation. The director is not paid for his or her services, although may receive expenses. Ideal for charities, it should be used by any company or other organisation that requires a contract with an independent non-executive director who will gift advice and support on a voluntary basis. This non-executive director's service contract is particularly strong on the protection of confidentiality and company secrets. It is flexible and can be used whether the term of the contract is fixed or running. Use of plain English makes editing easy and allows it to be understood by all parties. This is a contract for services. It makes absolutely clear that the relationship between the director and the organisation is one of unpaid consultancy (help) rather than employment. Despite there being no payment for services, the agreement provides for “consideration” so as to make the obligations of the director binding on him. appropriate for any non-executive, part-time director of any organisation.